Small green lorikeets in forested areas are notoriously difficult to spot, making determination of species status uncertain. 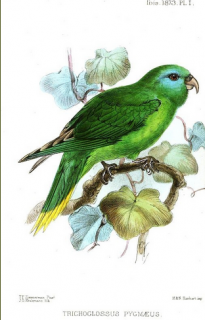 Both adults yellow/green in colour; bright blue forecrown, lighter and less extensive in female; green/yellow chin and throat; underwing stripe yellow, more evident in female; green tail tipped with yellow, with orange/red bases of lateral feathers. Bill orange. Eye yellow/orange. In general darker and duller in colour than adults; less yellow on chin and throat. Calls are described as very shrill. This species has been decimated by the almost complete clearance of coastal forest on Buru, and the degradation of forest on other parts of the island. Confined to Buru, S Moluccas, Indonesia. Apparently from 850-1000m (2788-3280 ft) in primary forest, some secondary growth and possibly in plantations. Feeds at blossoms in flowering trees, taking pollen and nectar. Little is known of their habits; they have been seen singly and in pairs, as well as groups of up to 10 birds.